When I was a freshman in college and first heard people talking about the cannon of literature, I was hopelessly confused. What could great literary works possibly have to do with cannons? Was I supposed to be bombarded with knowledge? Struck with inspiration? Shot dead for my use of bad puns in the presence of actual genius? Then I saw it written on the board: C-A-N-O-N. I figured that either the professor didn’t know how to spell it right, or the word was not actually a reference to a type of weapon. Fortunately for any student too lazy to look up the word previously in the semester, my professor assigned a reading on canon for homework. Eight years later, and I am still fascinated by the various canons we have in our culture, and the historical trends that led to them. But neither this blog, nor the accompanying podcast, are focused on the history of the literary canon. Both are, however, focused on identifying works that could be included in the comic book and graphic novel canon, which is a subsection of the larger literary canon. Since understanding the concept of a canon is instrumental in understanding the purpose of our podcast, I wanted to take a moment to explain what canon is, and why we are using it as a framework for our podcast. Canon is the collection of works that make up the very best of a field. A musical canon would include Bach, Mozart, the Beatles, while an art canon would include Picasso, Warhol, and Banksy. The works recognized as part of the canon are considered authoritative representations of what the field should strive to be. However, there isn’t one long list of all the works that make up the canon– at least, not in most fields. The lack of an authoritative list of what makes up the canon in any field leads to many scholars in the field debating what should and should not be considered canon. The exception to this rule is in Theological Studies, where the list of canonical works can be found in the Holy Bible. The Bible is largely recognized as the first canon to ever exist. As you may know, there are more works written about God, Jesus, and the Holy Spirit than there are contained in the Bible. At some point, the most sacred books were chosen and collected in the Bible and the remaining works were cast aside. As a result, the Bible is the authoritative representation of sacred texts written about Christianity– it’s the canon you can have collected in your hands in a single volume. Most canons extend over many works. For example, the literary canon is so large that it has to be divided into sections– there’s a canon for each century (eighteenth, nineteenth, etc), and for different genres (fantasy or YA). What is normally referred to as “The Literary Canon” are the works that many consider classic. This canon includes works like The Adventures of Huckleberry Finn, Anna Karenina, and The Three Musketeers. There’s a comic book canon too. What is important to note about the comic book canon is that it is substantially less developed than some of the other literary canons. There are several reasons why. One is due to the nature of comic books being a new genre, only formed in the early 1900s. Another is that comics are not considered “literary” by many scholars. Comics are rarely, if ever, taught in grades K-12, and only occasionally taught in college. The works that are taught in college courses are works that are chosen by English professors with training in a literary background. They comprise only a small fraction of comic book readers, and often are only reading a certain type of comic book. As a result, many of the comics considered canon are the ones chosen and taught by college professors, who chose and teach the ones considered canon, and it becomes its own “chicken or egg” situation. So, for example, if you were to ask a person with only a passing familiarity with comics which books are considered canon, they would likely say Watchmen by Alan Moore and Dave Gibbons, Maus by Art Spiegelman, or Persepolis by Marjane Satrapi. However, if you were to ask the same question of someone who considers themselves a comic book fan, you will probably still get the same answers as the above, but you might also get Y:The Last Man by Brian K. Vaughn, The Dark Knight Returns by Frank Miller, or The Walking Dead by Robert Kirkman. Within the comic community some works spark great debate in regards to whether or not it should be included in the canon. An example of a highly contested work is Batman: The Killing Joke by Alan Moore and Brian Bollard. This work is infamous for it’s problematic and brutal depiction of the assault on Batgirl, Barbara Gordon, by the Joker — an act of violence used only for the purposes of advancing the storylines of two male characters: Batman and Commissioner Gordon. However, many readers praise the book for its novel approach of crafting a possible origin story of the Joker . (I, frankly, despise most works written by Alan Moore, so the previous sentence was written by Steven, and I revised it for flow. I don’t actually know why people like the book. I fully expect that the book will end up on our podcast, and discussion will be brutal). The reason why I say that it is both canon and anti-canon is because I have never seen a book, comic or not, cause this much disagreement in readers. Readers on both sides of the argument will get furious with anyone who disagrees with them, and if you happen to be a reader who thinks “eh, it’s just a book” you have probably learned that it’s best just to keep quiet unless you want to be yelled at by both sides. In short, the people who are deciding the comic book canon are mostly academics, but they are not always the same people who make up the comic fandom. As a result the canon doesn’t adequately represent the best of comics. There is another issue with understanding canon, and it’s due to the fact that there is another definition. Some people say that when something is “in canon” it means that it happened in the story. For example, in 2012 when DC Comics launched their New 52 initiative, almost every character’s backstory was erased — except for Batman and Green Lantern — as the entire DC Universe started over again from square one. Which sounds fine on the surface, but what about when other characters interacted with Batman and Green Lantern? For example, did Wonder Woman really get tested by the entire Justice League when she went blind during Greg Rucka’s run? If you read her solo book or Justice League, the answer would have been a resounding “no”. However, since Batman was there testing and judging her in Eyes of the Gorgon, and his timeline was still intact the answer could have been “yes.” So was the Eyes of the Gorgon storyline canon or not canon in the New 52? I am confused by this second definition of canon because I can’t tell if it’s a reaction to fan fiction and multimedia depictions of the same characters, or if it’s because people are saying the word canon without actually knowing what it means. Personally, for clarity’s sake, if I mean something is in the canon, I mean that it is a work that I consider important and authoritative. If I want to refer to something as existing in the comic timeline, I will use the word “continuity” instead– it’s a word that has been used since I started reading comics, and its definition has stayed consistent in the community without causing confusion. Steven and I are using the canon (meaning authoritative texts) as a framework for our podcast because the comic book and graphic novel canon is new, still underdeveloped, and is still decided by academics and not regular readers. I do have a M.A. in English, and previously taught English to freshman at the university level. Steven has a J.D. and is a practicing attorney. Even though we are no longer active in academia, we aren’t completely removed from it; we both have over 5 years of higher ed under our belts. In other words, we offer a unique perspective because we have both experiences: that of academic readers and that of passionate comic book fans. 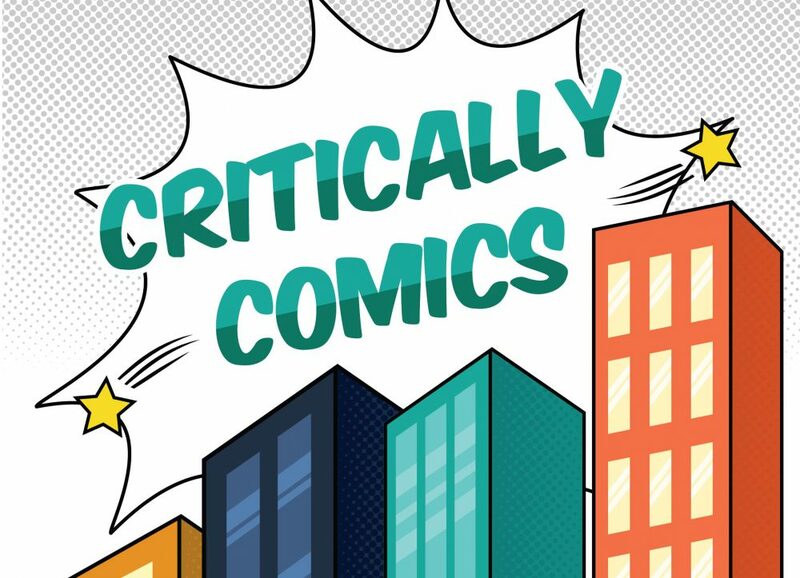 It is our hope that our perspectives on comics allows us to give enjoyable analyses of the books we read and discuss on the podcast as we attempt to decipher what books deserve to be in the comic book canon.